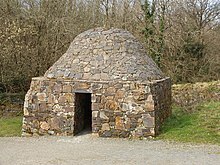 A clochán, or beehive hut, is a dry-stone hut with a corbelled roof, commonly associated with the south-western Irish seaboard. The precise construction date of most of these structures is unknown with any degree of certainty. According to archaeologist Lloyd Laing, "There can be little doubt that these buildings belong to a long-established Celtic tradition, though there is at present no direct evidence to date the surviving examples before c.AD 700". Some associated with religious sites may be pre-Romanesque, he considers most fully intact structures to date after the 12th century or later. They are most commonly round beehive huts, but rectangular plans are known as well. It has been suggested that the rectangular footprints date to a later era. Some clochans are not completely built of stone and may have possessed a thatched roof. The walls are very thick, up to 1.5 metres (4 ft 11 in). Sometimes several clochans are joined together by their walls. Clochans are mainly found in the Southwest of Ireland, for example at Skellig Michael, Church Island off Beginish Island, Glanfahan, Fahan and Reask in the Dingle Peninsula of County Kerry. Many occur in religious contexts such as used by the monks following Saint Patrick; moreover, his successors carried on the architectural tradition in the Scottish Isle of Iona and eventually via Aidan to the eastern English Islands of Farne and Holy Island. There are others in ringforts (such as Leacanabuaile, County Kerry) that are commonly interpreted as secular dwellings. Elaborate dry walled stone churches like the Gallarus Oratory may derive from clochans. The clochan has been described in the 7th to 8th-century law Críth Gablach. Parts of the 2017 film Star Wars: The Last Jedi, was filmed using the beehive huts on the island of Skellig Michael. Because of the restrictions regarding filming on the island, a set of replica beehive huts were also built in 2016 at Ceann Sibéal, near Ballyferriter, on the Dingle Peninsula. Edwards, Nancy (1990) The archaeology of early medieval Ireland, Batsford, London . ^ a b c d "Irish 'Beehive' Huts". Omnium Sanctorum Hiberniae. Retrieved 16 February 2019. ^ Laing, Llyod Robert (2006). The Archaeology of Celtic Britain And Ireland: C. Ad 400 - 1200. Cambridge University Press. p. 222. ISBN 9780521838627. ^ a b "Clocháin or 'Beehive' Houses". GoKerry.ie. Retrieved 16 February 2019. ^ Partick Nugent (9 December 2017). "Experience the Force: A guide to the Star Wars magic in Kerry". Irish Times. Retrieved 16 February 2019. ^ Alex Weinburg (2 January 2018). "The Real-World Architecture of Luke Skywalker's Jedi Hideaway". Atlas Obscura. The ancient Jedi shelter where Luke Skywalker resides is a very terrestrial building type called a clochán, a primitive stone dwelling that can still be found on Skellig Michael. These structures, also called beehive huts, were built by the ascetic Christian monks who first settled the island in the 6th or 7th century. ^ "Ceann Sibéal - Star Wars Film Location for 'The Last Jedi'". DinglePeninsula.ie. Retrieved 16 February 2019. A collection of beehive-shaped huts was built to reproduce the beehive huts of Skellig Micheal. Construction workers built a road across local farmland to bring the trucks, scaffolding, lighting, trailers, food, props and people up to the closed set. Lucasfilm later thanked locals for their support and hospitality. ^ Noel Baker (9 April 2016). "Big buzz as Star Wars recreates beehive huts at Ceann Sibéal in Kerry". Irish Examiner. Retrieved 16 February 2019. Wikimedia Commons has media related to Clochans.